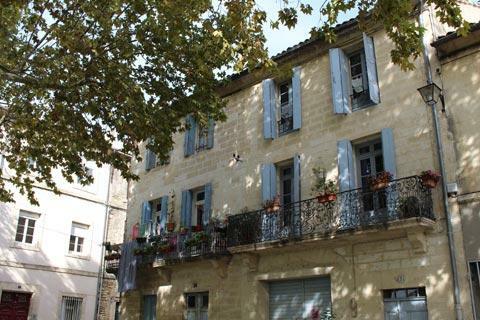 Sommieres is a historic town with ancient origins, situated in the valley of the Vidourle river half way between Montpellier and Nimes, and surrounded by the vineyards of the Gard department of Languedoc-Roussillon. Due to its important historic monuments, Sommieres historic centre is now officially designated as a 'secteur sauvegardé' - that is, it is protected from further development to ensure it retains its medieval character. 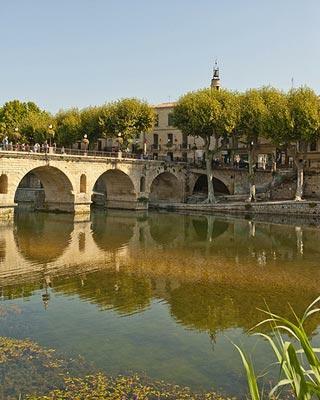 The most important historic monument in Sommieres is the bridge across the river, dating from the 1st century and part of a trade route between Toulouse and Nîmes. Originally this bridge had 20 stone arches although the current bridge only retains seven of these, with the others now incorporated into the structure of the surrounding houses. The bridge has been rebuilt and repaired many times during the last 2000 years, so much of what we can see today dates from later periods. The bridge is the best place to start your visit, since it also represents the origins of the town which developed on and around the bridge starting from the 10th century although there are no longer any buildings on the bridge itself. Bridges that were built on are quite rare but can be found in several places in Europe. The most famous is the Ponte Vecchio in Florence. 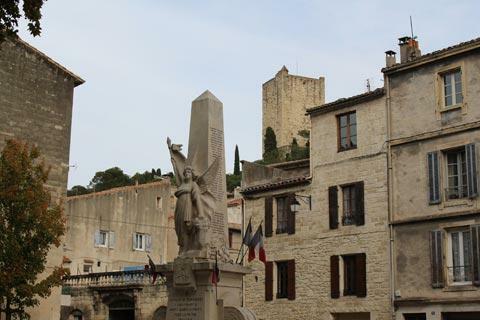 You will see three of the original entrance gates to the town as you explore, with the most impressive being the one next to the town hall at the end of the bridge with the belfry, a carved town insignia and a traditional wrought iron campanile on a small round stone tower. Enter the historic centre of Sommières through this gateway. 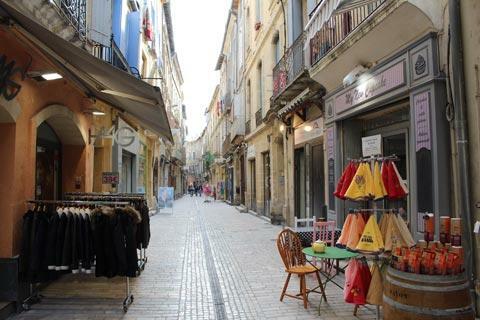 The Place du Marché in the centre of Sommieres is also picturesque with numerous arcaded properties. 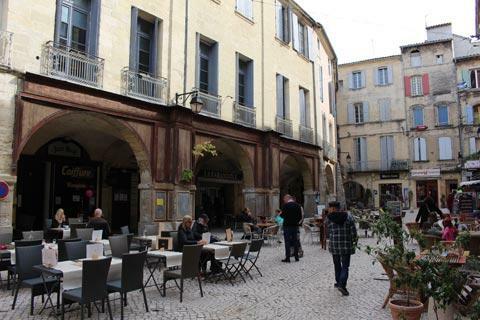 In many towns these arcades served as a place where market traders could gain shelter from the weather, and in Sommieres they also serve a second function - the town is very prone to flooding and the arcades help ensure the buildings are raised high enough to avoid the floods. Saturday mornings are the time to appreciate the market that has been held here for the last 800 years, and if you are visiting during the summer we also suggest you visit the market on a Wednesday evening for a outdoor market with many local products to enjoy and a festive communal atmosphere. Many of the narow streets around the centre also retain interesting medieval and arcaded houses, typically dating from the 15th to 18th centuries. Elsewhere in the town you will discover several other historic sites of interest, such as several churches that typically date from the 17th to the 19th centuries. 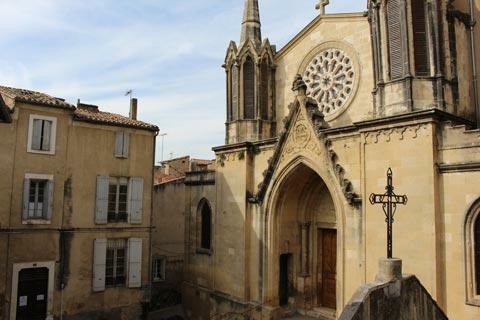 The Church of Saint-Pons, although completely rebuilt in the 19th century, is interesting because of the extensive painted decoration that covers the interior walls of the church and the large rose window. Another important monument in Sommieres is the remains of a medieval castle, with the square tower and some ruined walls being the most imposing remnants. The original castle was built to defend the bridge and had two similar towers, with the second being destroyed during war in the 16th century. 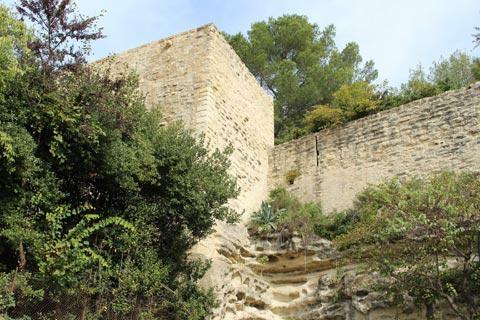 Note that the remaining tower is only open to the public during summer high season but you should still walk up to the castle to see the walls and also the views across the rooftops of Sommieres. 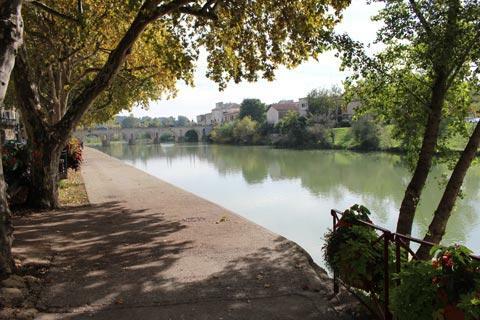 After exploring the town your children will be pleased to learn that there is a river beach at Sommieres, very popular in summer and with plenty of shade from the trees to escape the sunshine. Canoe hire is also available on the river, and you can follow a footpath along the river banks into pretty countryside around the town. 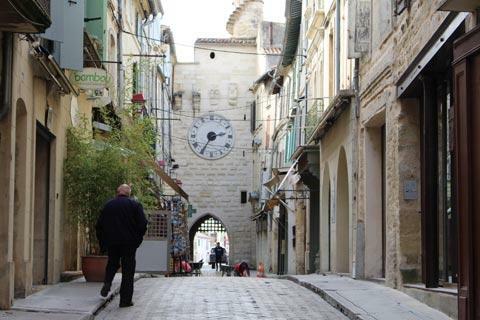 There is also much to enjoy and discover in the villages around Sommiéres. 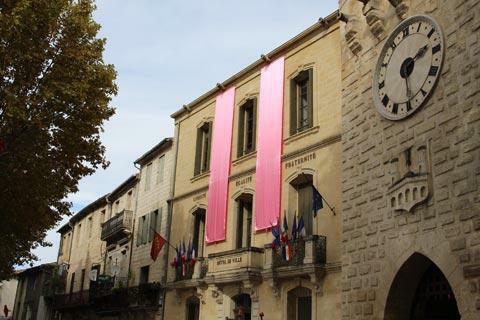 There are many of these, typically based around a small historical church, with Montpezat among our favourites. The Sommieres tourist office can provide you with information about the highlights in each of these small villages, and also forthcoming events in the vicinity. 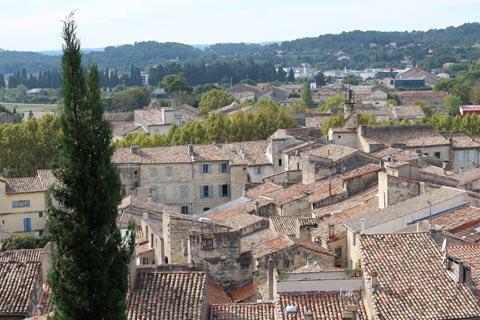 A popular way to explore is to follow the Voie Verte route from Sommieres to Caveirac (towards Nimes), a pedestrian and cycle route that passes through much of the attractive countryside of the region. Being built along the route of a disused railway line you also have the advantage that there are not too many hills! This route also gives access to many other paths and trails - details and a map are available from Sommieres tourist information office, and bike hire is available at 27 Place de la Libération in Sommières. 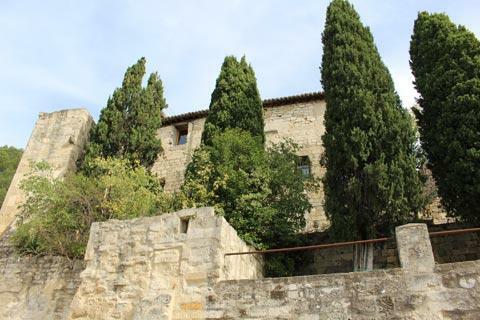 We also suggest you explore northwards along the Vidourle Valley, including time to visit the small towns of Sauve and Quissac, and to visit the nearby Chateau de Villevieille.